The Oconee County Board of Commissioners on Tuesday night took the unusual step of holding a zoning hearing at its agenda setting meeting and approved the issuance of a special use permit for a telecommunications tower on McRees Mill Road off Barnett Shoals Road. The Board took that action following a ruling by the United States Court of Appeals for the Eleventh Circuit in Atlanta overturning the Board’s denial in 2014 of the permit for Verizon Wireless on 42 acres at 1210 McRees Mill Road. County Attorney Daniel Haygood told the Board that the Court would order the county to issue the permit even if the Board turned down the request. The action by the Board on brings to an end the zoning request by Verizon, but two high-profile zoning issues will be on the agenda for the Board meeting on Tuesday night. The Board will take up again the request by Lenru Development LLC to build a shopping center between Lenru Road and Malcom Bridge Road just south of Malcom Bridge Elementary and Malcom Bridge Middle schools. Action on that request was tabled on Sept. 4. The Board also will hear a request by Townley Family Partnership LLLP to rezone 11.1 acres on Snows Mill Road at Cole Springs Road for a car museum and events venue. The county planning staff has recommend approval only on the condition that events not be part of the museum operation, but the Planning Commission has recommended approval of both the musuem and the events venue. The Board of Commissioners on Aug. 5, 2014, turned down a request by Sarah Deck for a special use to allow for construction of a cell tower on her 42-acre property following a negative recommendation by the Planning Commission and objections from citizens in the area. Verizon planned to lease 10,000 square feet of the McRees Mill Road property, which is zoned for agriculture, for a monopole tower. The special use permit is required for the tower. U.S. District Court for the Middle District of Georgia, Athens Division, in 2015 denied Verizon’s request to force the county to issue a permit for the tower. The Appeals Court ruled in April of this year that the lower court had erred in its determination of the time period allowed for Verizon to challenge the county decision. Oconee County Commission Chair John Daniell announced the Appeals Court ruling at the Board of Commissioners meeting on Aug. 28 and said that Georgia law requires that the Board of Commissioners conduct a public hearing on the issuance of the permit even though the outcome was fixed by the Court. Daniell set that hearing for Tuesday night. 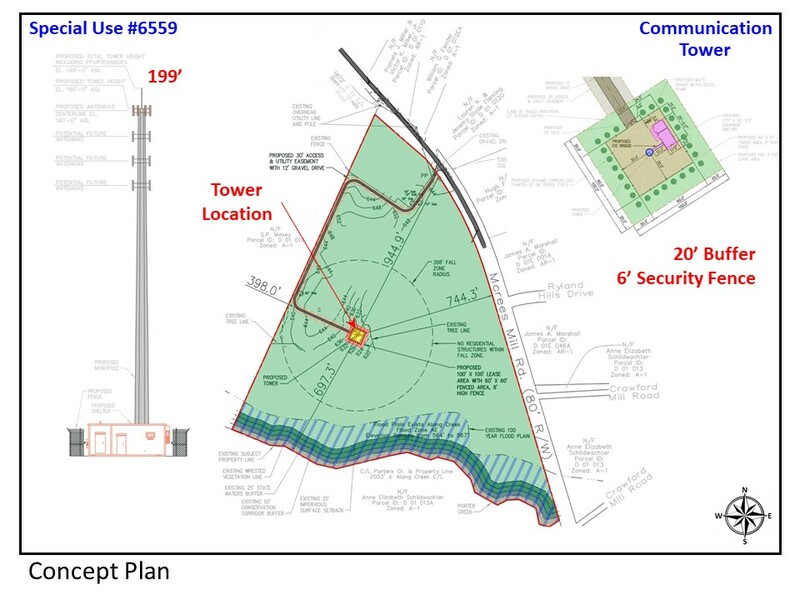 Guy Herring, director of Planning and Code Enforcement, told the commissioners on Tuesday night that the original request rejected by the Board was for a 199-foot cell monopole tower roughly in the middle of the triangular property. Staff is recommending approval of the permit, Herring said, under the condition that the tower should not be taller than 169 feet inclusive of a 9-foot lightning rod and should not be constructed prior to January of 2022. County Attorney Daniell Haygood said the county had negotiated the change in the size of the tower and construction date with Verizon. Anne Elizabeth Schildwachter, 1070 Crawford Mill Road, was the only person to speak at the public hearing. Schildwachter, whose property is across McRees Mill Road from the location of the cell tower, noted that the tower is in a rural, agricultural area. In other action on Tuesday, the Board held a public hearing on a proposal to close a portion of Peck Circle south of Farmington. Greg Peck, 2010 Salem Road, had asked the Board to abandon the prescriptive easement on a portion of Peck Circle so he can install a fence across the road to run cattle on the property. A prescriptive easement is an easement on property acquired by continued use. Five people spoke at the hearing. Alex Clark, 1140 Peck Circle, and Jack Lewis, 1070 Peck Circle, said they were not opposed to the road closing but asked that the one-lane road be widened to make it easier for cars to pass. Greg Peck said he was happy to give up right of way to create a cul-de-sac at the point where the road is closed but did not want to give up additional land to widen the road. Rolland Ebright, 2160 Salem Road, and Kenneth Peck, 1071 Peck Circle, spoke in favor of the closing and against widening the road. Final action on the request for the road closure is on the agenda for the Board of Commissioners meeting on Tuesday night, which starts at 6 p.m. at the Courthouse in Watkinsville. The Commission decided in September to postpone a decision on the Lenru Development request after hearing opposition from residents in neighborhoods surrounding the proposed shopping center. The Board said it would not re-open the public hearing but would revisit the request by Lenru Development for modification of plans approved 14 years ago for commercial development in a small strip of land now surrounded by residential development and a major school campus. The Planning Commission on Sept. 17 turned aside the concerns of the county’s planning staff, which recommended approval of the Townley rezone request only on the conditions that office space be restricted and that the museum owners could not lease out space for special events. The planners said that use of the 11.1 acres for public events is incompatible with surrounding land use and that the 151 parking spaces are sufficient for the museum and existing office but not for events that could attract large numbers of visitors. The Planning Commission voted 7-2 to send the proposal to the Board of Commissioners with a recommendation of approval minus the limitations on office space use and the prohibition on use of the museum for special events. At the beginning of the meeting on Tuesday, Commission Chair Daniell announced that the next Town Hall meeting will be held at 6 p.m. on Oct. 16 at Oconee Veterans Park, 3500 Hog Mountain Road. The video below is of the entire meeting of the Board of Commissioners. The public hearing on the McRees Mill Road cell tower permit begins at 10:48 in the video. The discussion of the Peck Circle closure begins at 1:35 in the video. OCO: BOC 9 25 18 from Lee Becker on Vimeo.